Introduction: Vital tooth preparation necessitates the application of desensitizing agents due to hypersensitivity that arises out of trauma. Many desensitizing agents are currently available in the market. One must, however, note that such an application creates a barrier between the tooth cement interfaces that may alter retention. This study investigates the same. Aim: The aim of this study was to compare the effect of two desensitizing agents on crown retention using resinomer cement. Materials and Methods: Thirty-three extracted human maxillary first premolar teeth were selected for the study, which was prepared using a special assembly and divided into three groups, i.e., (R + U, R + G, and R) to compare the effect of GLUMA and ULTRASEAL on crown retention using resinomer cement significant. Conclusion: The application of GLUMA desensitizing agent to resinomer cement resulted in an increase in retention that was statistically significant. ULTRASEAL is ill-suited to combine with resinomer cement. Dentistry is the health science that includes the study of basic principles and application of these principles to prevent deterioration of the oral structures and the use of pertinent clinical procedures to improve the oral health. Frequently patients exposed to fixed restorative procedures experience discomfort in the prepared teeth either during the treatment and sometimes following placement of restoration, which they perceived in the form of pain or other unyielding symptoms, which may be due to dentin hypersensitivity. Dentin hypersensitivity has been defined as short, sharp pain arising from exposed dentin typically in response to chemical, evaporative, thermal, tactile, or osmotic stimuli, which cannot be ascribed to any other form of dental defect or pathology. Earlier investigators stated that dentin hypersensitivity is an enigma being frequently encountered, yet ill understood. Desiccation, frictional heat generation during preparation, and chemical irritation from the luting agent are important factors that increase the likelihood of hypersensitivity. Retention of cast restoration is one of the basic principle criteria for success in fixed prosthodontics. It is mainly affected by the principles of tooth preparations and partially by variations in casting procedure, properties, and thickness of luting agents and postenvironmental stresses.,, Postcementation hypersensitivity is the most common problem encountered in the clinical practice because of the acidic nature of luting agents. In an effort to control postoperative sensitivity, a number of dentinal sealers have been described in the literature which is applied following crown preparation. These dentinal sealers may have an adverse or beneficial effect on retention of restoration, as these sealers may affect the bond strength of luting agents with the tooth structure. These sealers are basically glutaraldehyde and resin based. Sealing of dentinal tubules with resin-based sealer has been shown to greatly decrease hypersensitivity.,,, Most of the studies,,, conducted in the past compare the efficiency of different types of sealers in reducing the dentinal hypersensitivity; however, very few of them describes the effect of these sealers,,,, on the retention of crowns cemented with different types of luting agents. The purpose of this study was to evaluate the effect of two commercially available desensitizing agents, ULTRASEAL, and GLUMA® desensitizer, on the retentive ability of resinomer cement when used as a luting agent for complete cast crowns. Thirty-three extracted human maxillary first premolar teeth were selected for the study. Only noncarious nonrestored teeth were chosen. Teeth were cleaned using a scalar and then disinfected with 0.5% sodium hypochlorite and stored in distilled water. Roots were roughened, and the teeth were mounted in a special circular jig fabricated for the purpose, with cold-cure acrylic resin. The teeth were mounted with the cementoenamel junction (CEJ) 1 mm above the cold-cure resin. The entire procedure was carried out on a special assembly fabricated for the purpose and mounted on a surveyor [Figure 1]. A new flat end tapering bur was used for every axial preparation to ensure uniform convergence angle of 20 degrees. A shoulder finish margin was given. The depth of the axial preparation was kept equal to the diameter of the tapering bur. The length of the preparation was 4 mm above the CEJ. A new diamond point and finishing point was used for each sample for the purpose of standardization. An elastomeric impression of each prepared sample was made, and dies were poured and labeled. The axial surface area of each sample was calculated by an electronic scanner. The same procedure was repeated for all the samples. All of the above was carried out by the same individual. The samples were then redistributed such that the total mean surface area of all the groups was the same. Die hardener was applied to each die followed by a single layer of die spacer. This was followed by the application of die lubricator. 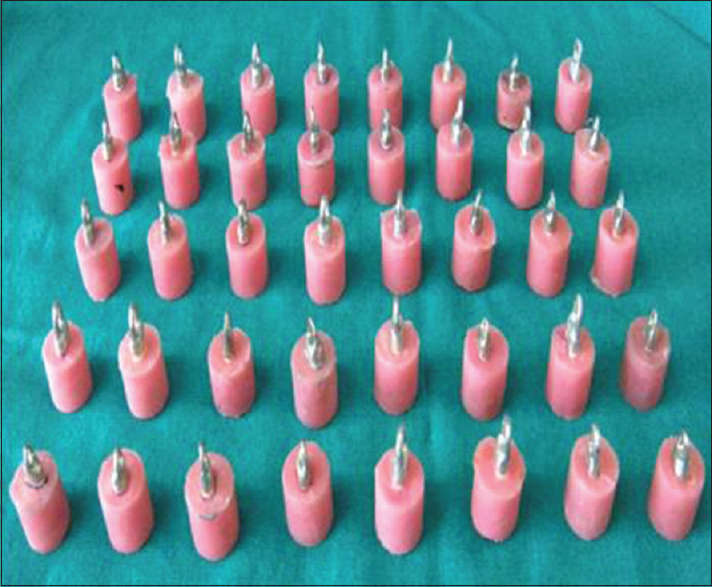 Wax patterns were then fabricated by dipping the master die in a wax bath. Two coatings were applied; allowing the previous layer to set. Prefabricated wax loops were then attached to the wax patterns; to facilitate the testing on an universal testing machine. The completed pattern with the loop was then invested and cast using base metal alloy to obtain individual coping [Figure 2]. Two dentin sealers (ULTRASEAL and GLUMA) were used to seal the dentin. Crowns in the control group were cemented without any dentin sealer. The dentin was etched for 15 s in 32% phosphoric acid and then washed for 20 s. Moisture was removed, and two coats of sealer were applied allowing the previous layer to dry. The application of desensitizers was carried out just before cementation. An electronic microbalance was used to ensure that equal amounts of powder and liquid. The castings were then lined with cement and seated using a loading machine, 20 kg's for 10 min. The excess cement was removed before the final setting of the cement (10 min). The specimens were then stored in water for 24 h. To simulate stress, the crowns were thermocycled from 5°C to 55°C for 2500 cycles using a dwell time of 30 s. A UNIVERSAL testing machine was used to dislodge the crowns [Figure 3]. Axial dislodgement forces were then applied until failure at a crosshead speed of 0.5 mm/min through a universal testing machine. Both the dislodged crowns and teeth samples were examined for the type of failure under an optical microscope. The means and standard deviations of each treatment group were determined. 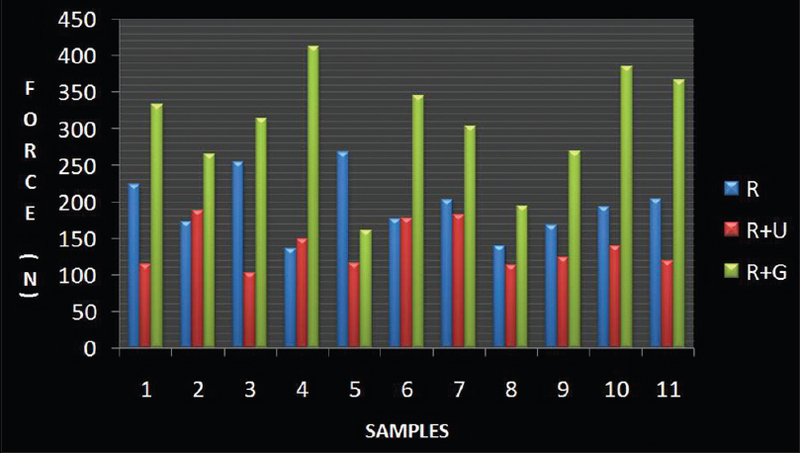 Data were analyzed using the one-way analysis of variance (ANOVA). Tukey's honestly significant difference test was used to determine the significance of differences between the means. The following observations were made in the process of the study undertaken to evaluate the effect of desensitizing agents on crown retention. The type of cementing agent used in the study will henceforth be referred to as Type R, for ease in comparison. Type R + G: Specimens treated with GLUMA and luted with resinomer cement. The specimens were hence divided into three groups; each comprising of 11 specimens. The statistical analysis was done using the oneway ANOVA initially to analyze the effect of the two desensitizing agents compared visavis the control group [Table 1]. Group R + U showed retention values lower than Group R + G and Group R; the difference between Group R + U and Group R + G being statistically significant. Desensitizing agents may reduce tooth sensitivity by forming a thin barrier that protects the tooth structure from external insults, but then deprives the cement of micromechanical retention on the tooth structure., However, the surface roughness of the crown is yet available, and the cements may interlock in them. It is imperative to remember that crown retention depends primarily on the taper obtained. The role of the cement is to fill in the space between the crown and tooth structure and protect against microleakage. Past studies have been carried out on All Bond, One Step, and GLUMA., For this study, a resin primer “GLUMA” from Heraeus-Kulzer and “ULTRASEAL” from ultradent have been selected as desensitizing agents. “GLUMA” is composed of glutaraldehyde (5%) and 2-hydroxyethyl methacrylate (35%). Scanning electron microscope studies carried out by Wolfart et al. demonstrate that an abutment surface treated with “GLUMA” looks very much like the unprepared dentine with the tracks of the bur being visible and the surface also being roughened. Thus, it has a beneficial effect on adhesion. “ULTRASEAL” is a resin sealant from ultradent. It is composed of nonpolymerizable, high-molecular-weight resin in a volatile organic solvent. It forms a virtually impenetrable barrier against acids, cements, and restoratives. A study carried out by Reinhardt et al. using GLUMA and another by Mausner et al. revealed no effect on the shear bond strength of the cement to the dentin or on the retention of crowns luted with resin cement., In an another study carried out also revealed a reduction in crown retention using resinomer cements. Majority of the decementation tests resulted in an adhesive type of failure for all groups; ranging from mixed type to complete stripping of the cement from the tooth structure. Crown retention values for GLUMA combined with resinomer cement is increased in the present study [Figure 4]; this is in accordance with results obtained in a previous study carried out by Johnson et al. in 2004. Studies with similar results were also obtained by Reinhardt et al. Crown retention values for ULTRASEAL and resinomer cement decreased in the present study; this was also in accordance with past results obtained by Mausner. Johnston JF, Dykema RW, Goodacre CJ, Phillips RW. Johnston's Modern Practice in Fixed Prosthodontics. 4th ed. Philadelphia: W.B. Saunders Co.; 1986. Johnson RH, Zulqar-Nain BJ, Koval JJ. The effectiveness of an electro-ionizing toothbrush in the control of dentinal hypersensitivity. J Periodontol 1982;53:353-9. Watson TF, Flanagan D, Stone DG. High and low torque handpieces: Cutting dynamics, enamel cracking and tooth temperature. Br Dent J 2000;188:680-6. Kern M, Kleimeier B, Schaller HG, Strub JR. Clinical comparison of postoperative sensitivity for a glass ionomer and a zinc phosphate luting cement. J Prosthet Dent 1996;75:159-62. Shillinberg HT Jr., Sumiya H, Whitsett LD, Richard J, Brackette SE. Fundamentals of Fixed Prosthodontics. 3rd ed. Chicago: Quintessence Publishing Co., Inc.; 1997. p. 119-28. Rosenstiel SF, Land MF, Fujimoto J. 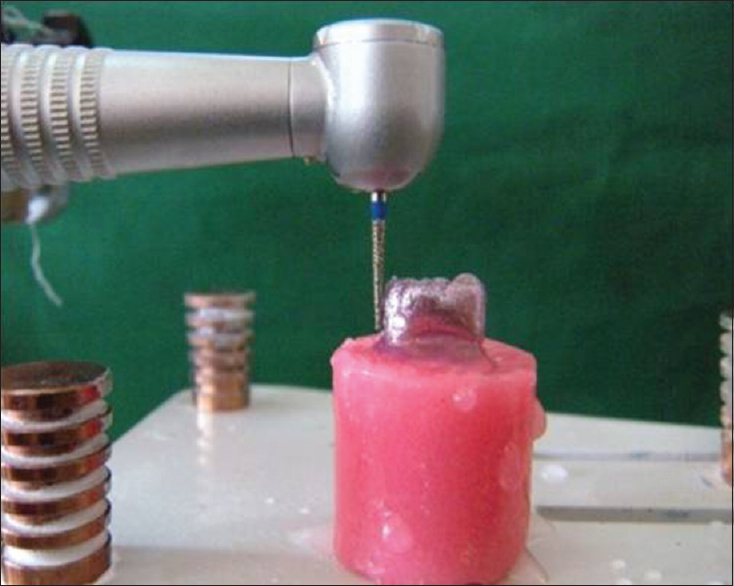 Contemporary Fixed Prosthodontics. 4th ed. St. Louis: Mosby Inc.; 2006. p. 226-43. Tyllman SD, Malone WF, Koth DL, Edmund C Jr., Kaiser DA, Margano SM. Theory and Practice of Fixed Prosthodontics. 8th ed. New York, USA: Medico Dental Media International Inc.; 2001. p. 113-35. Yim NH, Rueggeberg FA, Caughman WF, Gardner FM, Pashley DH. Effect of dentin desensitizers and cementing agents on retention of full crowns using standardized crown preparations. J Prosthet Dent 2000;83:459-65. Watanabe T, Sano M, Itoh K, Wakumoto S. The effects of primers on the sensitivity of dentin. Dent Mater 1991;7:148-50. Dondi dall'Orologio G, Malferrari S. Desensitizing effects of Gluma and Gluma 2000 on hypersensitive dentin. Am J Dent 1993;6:283-6. Magne P, Kim TH, Cascione D, Donovan TE. Immediate dentin sealing improves bond strength of indirect restorations. J Prosthet Dent 2005;94:511-9. Palacios RP, Johnson GH, Phillips KM, Raigrodski AJ. Retention of zirconium oxide ceramic crowns with three types of cement. J Prosthet Dent 2006;96:104-14. Magne P, So WS, Cascione D. Immediate dentin sealing supports delayed restoration placement. J Prosthet Dent 2007;98:166-74. Sarac D, Sarac YS, Kulunk S, Kulunk T. Effect of the dentin cleansing techniques on dentin wetting and on the bond strength of a resin luting agent. J Prosthet Dent 2005;94:363-9. Duarte S Jr., de Freitas CR, Saad JR, Sadan A. The effect of immediate dentin sealing on the marginal adaptation and bond strengths of total-etch and self-etch adhesives. J Prosthet Dent 2009;102:1-9. Shillingburg HT, Hobo S, Whitsett LD. Fundamentals of Fixed Prosthodontics. 3rd ed. USA: Quintessence Publishing; 1997. Wolfart S, Linnemann J, Kern M. Crown retention with use of different sealing systems on prepared dentine. J Oral Rehabil 2003;30:1053-61. Available from: https://www.kulzer.com/int2/int/dentist/products.../gluma. [Last accessed on 2018 Nov 24]. Vargas MA, Fortin D, Swift EJ Jr. Bond strengths of glass ionomers using a dentin adhesive. Am J Dent 1995;8:197-200.